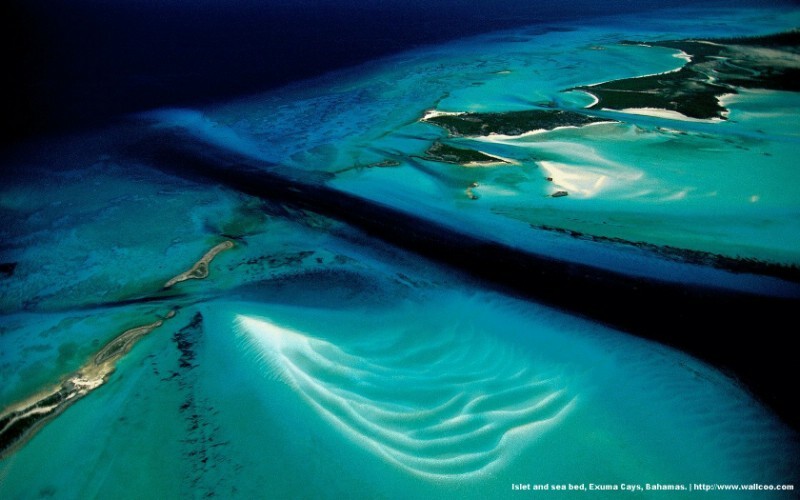 鸟瞰巴哈马：埃克苏马群岛，The archipelago of the Bahamas, which takes its name from the Spanish term baja mar (?shallows? ), spreads out in an arc in the Atlantic Ocean, running 750 miles (1,200 km) with 5,405 square miles (14,000 km2) of land above water level from Florida to Santo Domingo. It consists of more than 700 islands (29 of which are permanently inhabited), plus a few thousand rocky coral islands called cays. It was on these islands, specifically on Samana Cay, that Christopher Columbus first set foot on October 12, 1492, during his first voyage. During the 16th and 17th centuries the Bahamas were a center of piracy. They became a British colony in 1783, which they remained until their independence in 1973. They derive most of their resources from tourism (60 percent of the GNP), which employs two out of three Bahamians but which suffered from the damage caused by Hurricane Jeanne in September 2004. The country’s second major source of revenue is banking (15 percent of the GNP): it is a haven with no income tax. The Bahamas have also become one of the centers for drug traffic (marijuana and cocaine) and illegal immigrants bound for the United States.